The keel is best described as a “long” fin, not a deep fin. 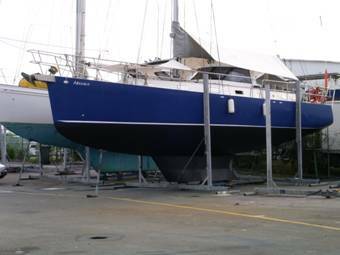 This allows modest draft ideal for cruising, while still keeping the four tons of molten lead ballast as low as possible for maximum stability (comes up to only 18cm above the keel foot). The flare in the foot of the keel effectively creates a steel- encapsulated lead bulb. The design is immensely strong compared to fibreglass boats with bolt-on keels. All the benefits of a modern design with lead bulb ballast, but without the drawbacks. Haul out at Scarborough Marina, Brisbane. 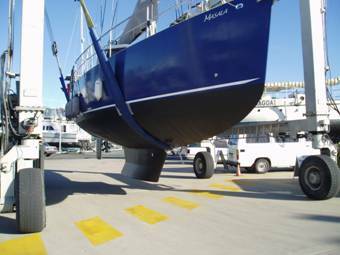 Note the deep V-shape of the hull forward of the keel—this gives a soft re-entry to the hull when sailing to windward in rough seas—no noisy and disturbing pounding or slamming. Also, note there is a lot of boat sitting under the water. 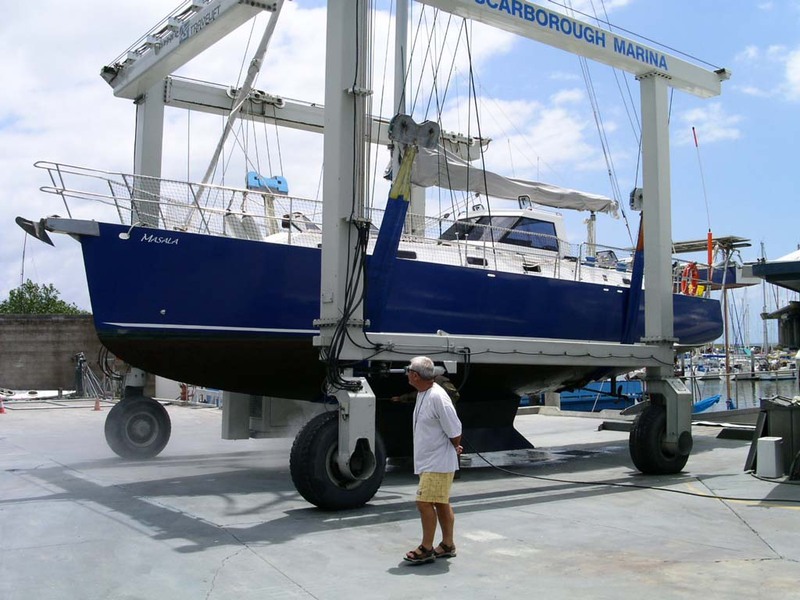 This is a blessing at anchor—shallow-bilge flat-bottomed modern fibreglass production yachts sit on the water, not in it, so are much less comfortable at anchor in rolly conditions. This is a good view of the skeg-hung rudder. 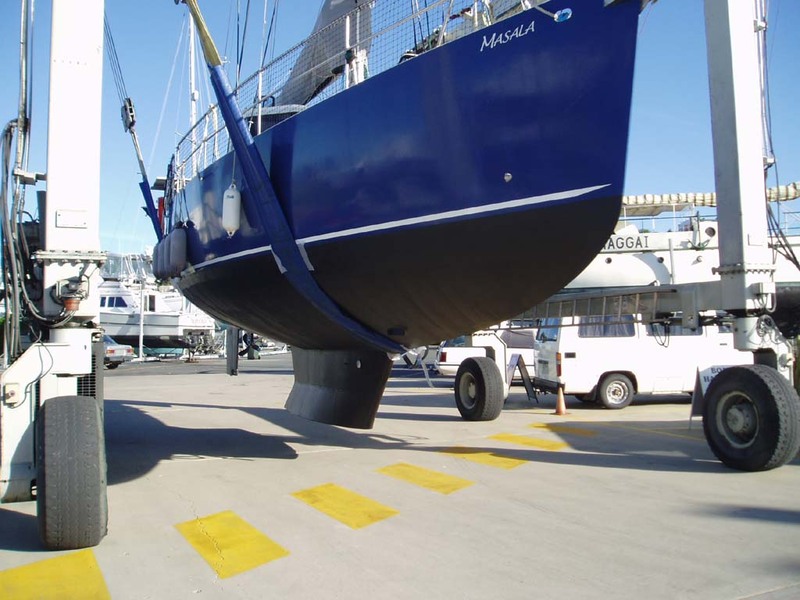 The rudder is often a vulnerable item in yachts. Masala’s rudder is a true cruising design with strong skeg for protection and three bearing points, including one at the very base of the rudder for maximum strength. This setup provides excellent directional stability at sea, which assists the autopilot to steer in rough conditions. Also note the substantial targa bar with solar panels and removable dinghy davits, and easy access to the water via the sugar scoop (even with the dinghy in place). Ready for re-launching. Again note the deep V-shape of the hull forward and the fine bow for excellent windward performance. In summary, here you have a modern underwater profile with fine bow, fin keel, lead bulb ballast, windward ability, and plumb bow to give maximum waterline length and lots of speed, yet still retaining the best characteristics of classical design including soft motion and good directional stability. Offshore rated, and no keel maintenance required! Shows the skeg supporting the drive shaft, and the original fixed three-blade propeller (now on board as a spare). 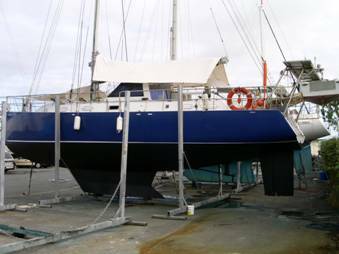 After professional hull preparation and spraying with 20 litres of top-of-the-range Jotun Sea Victor 50, with anti-slime agents. Remarkably there is almost no fairing of the hull below the waterline—the construction and welding of the hull is of the highest standard. 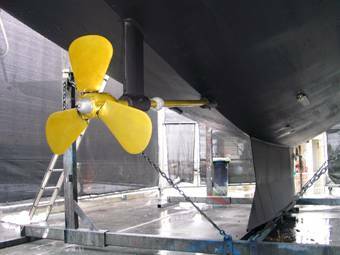 Also shown is the professional application of Propspeed antifoul to the drive shaft and propeller. Pride of place goes to the new propeller—a 20" x 13" 3-blade Autostream stainless steel feathering unit. Forward and reverse pitch of the blades can be set separately, and can be adjusted under water if necessary. The propeller is set with coarse pitch in forward gear (for optimum motoring ability), and fine pitch in reverse (for extra stopping power and control when in confined spaces). 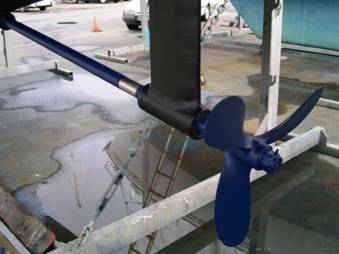 The new propeller has improved sailing performance by 0.5 – 1 knot, with higher pointing ability. It is also quieter inside the boat when sailing because the propeller shaft and gearbox no longer rotate.